On May 9th and 10th 2013, The North-South Institute held an international forum on Governing Natural Resources for Africa’s Development bringing together senior Canadian and African policymakers and government officials, extractive industry executives, global and African civil society groups, multilateral institutions, donor agencies, diplomats, think-tanks and academics. Using Natural Resources for Broad-based Development: How can the OECD help? Extractive Sectors Governance and Development: What Role for Canada? 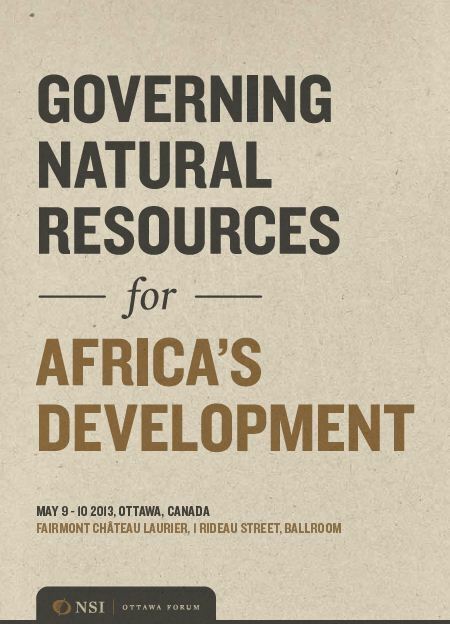 Africa’s Rising Resource Challenges, OpenCanada, June 17th 2013. Canada Urged to Ensure Miners Publish What They Pay, by Kristen Shane, Embassy Magazine, May 15th, 2013. Photos from Embassy Magazine’s Party Time, by Sam Garcia, Embassy Magazine, May 9th, 2013. NSI President’s Interview on Natural Resource Governance, Radio Canada International, May 7th, 2013.